Sign up for Broadjam today to follow The Uptown Band ft. Erich Cawalla & Jenifer Kinder / Erich Cawalla, and be notified when they upload new stuff or update their news! 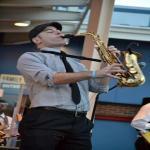 Thanks for supporting The Uptown Band ft. Erich Cawalla & Jenifer Kinder / Erich Cawalla! Would you like to help The Uptown Band ft. Erich Cawalla & Jenifer Kinder / Erich Cawalla get heard by industry pros by buying them a song submission credit to Broadjam Music Licensing Opportunities?